Biography of Private 1665 Alfred Alexander Burt, V.C. Biography of Second Lieutenant Frank Edward Young, V.C. 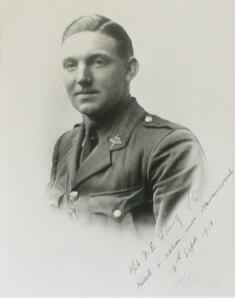 Second Lieutenant Frank Edward YOUNG, V.C. Killed in Action 18th September 1918, aged 23. Frank Young was born on the 2nd October 1895, at Cherat in the North West Province, India. As his father, also called Frank Young, was a regular soldier, it is likely he was serving in the 1st Battalion of the Bedfordshire Regiment who were stationed there at the time. When Frank's schooling in England finished, he joined the part time Territorial Force's Hertfordshire Regiment as a Boy Bugler on the 15th November 1909, aged 14. He served in the Hitchin Company which would later become D Company or No.4 Company once they adopted the Guards' Company structure. His father attested into the Hertfordshire Regiment when war broke out and was Company Sergeant Major 3292 Frank Young of the Hertfordshire Regiment by the time the battalion were mobilised to the Western Front in November 1914. The 19 year old Private Frank Young volunteered for service aboard but a physical disability stopped him from going to France in the autumn of 1914. However, his determination led to him going through an operation to overcome the problem and was appointed to the recently raised 2nd/1st Battalion of the Regiment to re-train and get fit enough for active service again. Frank went to France in a reinforcement draft, landing on French shores on the 21st January 1915 and soon became a Regimental Scout. Within months he was a Sergeant and had gained a reputation as a solid leader, a reliable scout and a good bomber. After returning from a spell in the front line, Frank was in a group photograph with his father and several other veteran Sergeants, which was taken in June 1915 and can be seen here. The Royston Crowe (dated 26th March 1915) mentioned how effective at patrolling his father RSM Young was, describing how the party he was in got to within yards of the German lines and managed to gleam a lot of information from listening in on their chatting. In the 27th August 1915 edition his father, Regimental Sergeant Major Young, was mentioned during an interview with Distinguished Conduct Medal winner Sergeant Major George Raven, who could not praise him enough and said "it is a pleasure for anyone to serve under such a fine soldier as he is". Comments made make it clear that RSM Young was a man to lead from the front and he frequently got 'in the thick of things'. Father and son were both involved in the Battle of Fesubert in May as well as the Battle of Loos in September, with Frank Young senior earned a mention in despatches for bravery at Loos. Frank received a month's leave early in 1916, as was the custom once a soldier completed his contractual term of military service. Having earned a reputation as a bomber, he was sent to serve as a Bombing Instructor at the Rouen Central Bombing School but an accident returned him home early in the summer of 1916. After three months in the Cardiff Military Hospital, he was posted to the 3rd/1st Battalion to re-train, who were stationed at Halton Camp near Tring at the time. Some months later he was commissioned as an officer, which was gazetted on the 26th April 1917. In the spring of 1918 Second Lieutenant Young was posted into the 3rd/5th Battalion of the Bedfordshire Regiment, who were stationed at Crowborough in Sussex. It appears he was fascinated by the Royal Flying Corps to such a degree that he took six weeks ground training at Reading and moved to Sleaford for practical training. However, a flying accident left him badly shaken and as a result he returned to the Bedfords. He paid a last visit to his mother in Hitchin in September 1918 before going to the front again, having been posted back to the 1st/1st Hertfordshires as a replacement for the losses during the Battles of Albert and Bapaume in August and September. He rejoined the Hertfords on the 12th September, just as they were engaged in the Battle of Havrincourt during the Battles of the Hindenburg Line. Frank was put in command of No.4 Company (his old Hitchin Company) who were in the line south east of Havrincourt village, near a copse called Triangle Wood. His last communication home was on a standard field postcard dated 17th September, the day before an unexpected German counter attack hit their lines. "For most conspicuous bravery, determination and exceptional devotion to duty on 18th September, 1918, south-east of Havrincourt, when during an enemy counter-attack and throughout an extremely intense enemy barrage he visited all posts, warned the garrisons and encouraged the men. In the early stages of the attack he rescued two of his men who had been captured, and bombed and silenced an enemy machine gun. Although surrounded by the enemy, 2nd Lt. Young fought his way back to the main barricade and drove out a party of the enemy who were assembling there. By his further exertions the battalion was able to maintain a line of great tactical value, the loss of which would have meant serious delay to future operations. 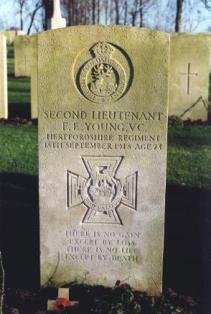 Throughout four hours of intense hand-to-hand fighting 2nd Lt. Young displayed the utmost valour and devotion to duty, and set an example to which the company gallantly responded. He was last seen fighting hand to hand against a considerable number of the enemy." Second Lieutenant Young was not seen again and he was listed as missing in action. However, on the 27th September a section from the 1st/5th Manchester's found his body on the edge of Havrincourt Wood. Given how heavily he had been engaged in the fighting, with much of it being hand to hand, it seems ironic that he had been killed by a shrapnel wound to his head. The men buried the body where they found it and marked it with a rough cross, as was the custom with battlefield burials. Some months later his grave was seen by Second Lieutenant Males from Stevenage who arranged to move the body to a more fitting resting place, amongst one of the growing official British Cemeteries. Frank lies in the Hermies Hill British Cemetery, France 4 km south of the N30 road between Bapaume and Cambrai. He is also remembered on the Hitchin War Memorial in St Mary's Churchyard, Hitchin in Hertfordshire. According to the British Legion, "his Victoria Cross remained with the family until 1959 when it was bequeathed to the Hertfordshire Regiment, at which time it was presented to the successors to the Regiment at Colchester and held with the Regiment Battle Honours. Later the Regiment lodged it for safekeeping with Luton Museum, which holds many exhibits relating to the Hertfordshire and Bedfordshire Regiments." Frank was the son of Frank and Sarah Ellen Young, of 46, Wood Avenue, Folkestone in Kent, which would have been their temporary address whilst his father was at No.3 Rest Camp in Folkestone early in 1919. In 1919 His father's medals were sent to Pirton Cottage, Pirton, near Hitchin, Hertfordshire and Frank's were sent to his mother at Verulam Rd, Hitchin, which was where they appear to have moved to after Folkestone.